How to use Bullet Chart formats – How can we help you today? Overview Create a Bullet Chart to measure a performance value against a target and a range value/s. Use indicators to change the color of the performance value. Use different colors to create a comparative range. The black line represents the Target value. The green bar represents the Performance value. The grey area represents the Range value. If it is not in this format (for example, if it is an array of values), use the JOIN function to convert it to a comma-separated value. Download the data source to build the example Bullet Chart in this article. Select a Table component, then select the Data panel. Click Insert Function and from theText category, select the JOIN function. In the formula bar, select the data element, click Insert Function button and select the ARRAY function (the ARRAY function returns a list of values). In the formula bar, select the first data element in the ARRAY function. Select the Target value (cell D2 using our example spreadsheet). In the formula bar, select the second data element in the ARRAY function. Select the Performance value (cell B2 using our example spreadsheet). In the formula bar, select the third data element in the ARRAY function. Select the Range value (cell C2 using our example spreadsheet). Select the Properties tab and from the Format as drop-down list select Mini Chart: Bullet. You can apply indicators to the Performance value on the Bullet Chart, for example to change the color of the bar depending on its value. You can apply a different color to compare a range of values. For example, in the following Bullet Chart: 450 displays as grey, 200 displays as orange, and 100 displays as blue. The following data source demonstrates how you can do this. The first value for the range of values must be the largest in the series. Build the following formula for this Klip. The comparative range that displays in a different colour are the cell values: C2, C3 and C4. 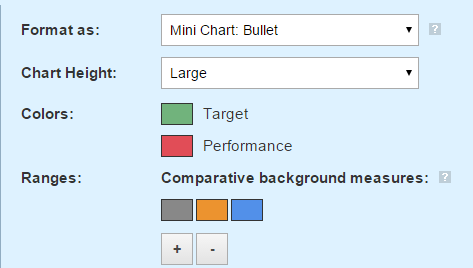 For this to display, change the format to Mini Chart: Bullet and select the following colors in the Properties panel.